Click Here To Receive Our Catalog. This is a hand-made personalized all-leather briefcase bag, double layered with visible raw edges to unveil the 4-5 ounce full grain Buffalo leather that is used in its entire construction. It is put together with thick stitching and Solid weather Proof hardware. 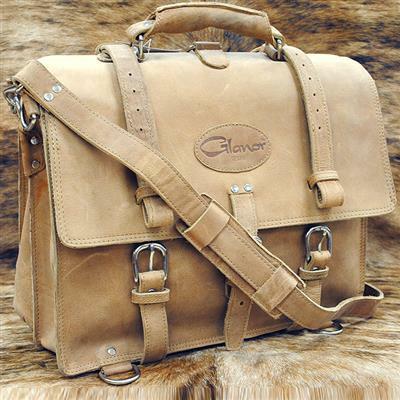 This bag is made by GLANOR. This is a typical example of the bags Glanor makes that combines the demand for contemporary looks and classic design for durability. These bags are typically made on custom requirements and supplied to some of the finest and most exclusive store chains in the USA where they retail for an average value of $550 and more. 2019 Copyright Glanor Corporation. All rights reserved. Implies item in stock and ready to be shipped immediately. Implies item made on order within 30 business days; additional charges added to base cost of item. Implies item made on order within 30 business days; additional charges added to intial item cost.